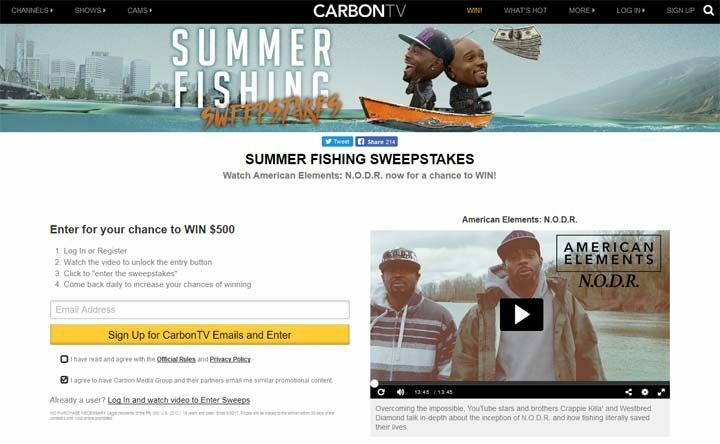 The CarbonTV’s Summer Fishing Sweepstakes is open only to legal residents of the fifty (50) United States (and the District of Columbia), who are at least eighteen (18) years old. The CarbonTV’s Summer Fishing Sweepstakes ends on June 30 at 12:00 p.m. ET. To enter visit carbontv.com/sweepstakes to sign up for a free CarbonTV account and complete the entry form. Limit of one (1) prize per person and per family or household. 1 GRAND PRIZE: VISA Gift Card. Approximate Retail Value (“ARV”): $500.00 USD. 1 SECOND PRIZE: VISA Gift Card. Approximate Retail Value (“ARV”): $100.00 USD. 1 THIRD PRIZE: CarbonTV Swag Pack. Approximate Retail Value (“ARV”): $75.00 USD.